Do you want to party until 1:30 AM? Then Late Night is your campground. Sites are going fast so reserve your favorite site soon. Please remember though, there are rules. Such as Quiet Hours are at 1:30! Late Night just gives you the most time for RIVER FUN! Should you be driving on Float Day? FREE! Saturday Morning Campground Bus Pickup! 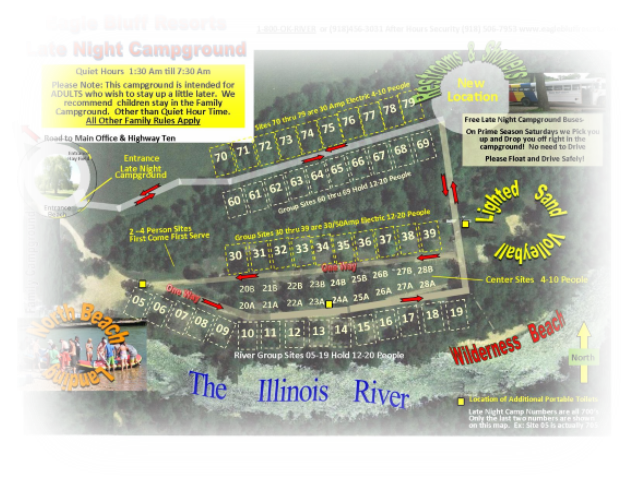 The Late Night Campground is conveniently located just upriver of the North Beach Landing. The Late Night Campground is designed for large groups of adults. All of the Sites in Late Night are group sites, most designed to hold 12-20 Guests. We also have some sites designed for smaller groups of 4-10, some with electric. Many sites are directly beside the river, and most have large trees. And remember the Late Night Campers have their own lighted sand volleyball courts and beautiful Shower House right in the Late Night Campground. And of course, who can forget the Private Wilderness Beach. We keep it easy at The Bluff. Just fill out ONE Reservation Request on this website to reserve your favorite site. ONE payment pays for your float and camp. An Express Code lets your friends pay for their own trip. Then ONE check-in for your camping and your floating. It's that easy! Next Stop River Fun!